A squirrel in the ‘Thunderdome’, photo by Amanda Kelley. The researchers assessed squirrel personality by capturing individuals and temporarily placing them in a ‘thunderdome’, essentially a white box with a clear lid. “We video the squirrel’s behaviour in this new environment, and after a set amount of time, show the squirrel a mirror.” The bushy-tailed rodents believe the mirror to be another squirrel of the same size and respond accordingly. Amanda Kelley with the Thunderdome in the background, photo by Amanda Kelley. Squirrels react to the mirror in very different ways. Remarks Kelley, “Some individuals are really confrontational and immediately rush the mirror, tapping it with their little paws, while others retreat to the furthest corner and avoid eye contact.” These thunderdome trials give insight into an individual squirrel’s personality. 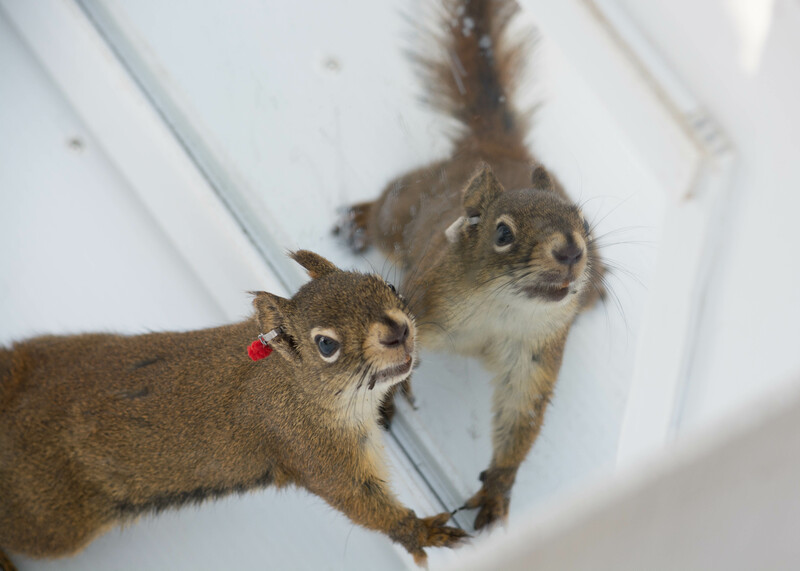 The mirror test reveals how aggressive a squirrel is, while the time a squirrel initially spends scurrying about gives insight into how active it is. 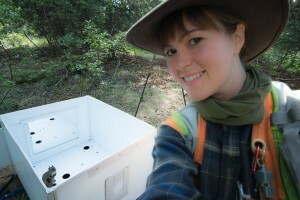 Kelley’s team conducted personality tests for each squirrel at two ages: first, when newly emerged from its mother’s nest, and again eight months later, when squirrels were fully mature. As with aggression, the researchers found that a squirrel’s activity became less extreme with age. “The busiest squirrels slowed down the most. In fact, very few increased at all,” says Kelley. This suggests that, on the whole, squirrels mellow with age. 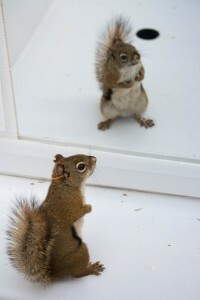 A squirrel checks himself out in the Thunderdome mirror, photo by Amanda Kelley. Kelley and her colleagues hypothesize that having flexible personalities is important for young squirrels. “After a juvenile leaves the nest, it has to strike out on its own and find a territory,” says Kelley. “It’s a very dangerous period, where certain behaviours can have severe consequences.” As squirrels mature, extreme personality types may carry a disadvantage, meaning their success may depend on finding a happy medium between keeping their cool and sticking up for themselves. The findings were published in the journal Behaviour. Contact Amanda Kelley, Field Coordinator for the Kluane Red Squirrel Project, for interviews or more information. This entry was posted in Blog by jahaines. Bookmark the permalink.